We all know Mark from his blog ‘As Easy as Riding a Bike‘ and we appreciated his coming to talk at our meeting. Tasks should be smaller than people’s capabilities. 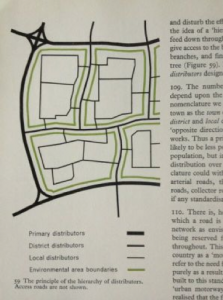 The idea arose from Colin Buchanan’s ‘Traffic in Towns ‘(1963). Unfortunately the UK failed to implement these ideas. Instead, High Streets have become major truck roads. (vehicular urban streets with fumes and noise). From the many quotes from ‘Traffic in Towns ‘ that Mark followed up with, it is sad to think the opportunity we missed in the UK. e.g. Assen cells are about one mile across. Ensure dense network of cycle routes.